Bu sayfa başka bir dilden çevrilmektedir. Çeviriye kalınan yerden devam edebilirsiniz. Çeviriyi başlatan kişiyle iletişime geçip sayfanın durumunu sorabilirsiniz. Sayfanın geçmişinden sayfa üzerinde çalışanları görebilirsiniz. Metabolizma (Şekil 1) yaygın tabirle besinin enerjiye, hücre yapılarına ve atık ürünlere dönüşümüdür. enerji kaynağı, her şeyden önce, enerjisi fotosentez yoluyla kullanılan güneştir. katabolizma, besinin kimyasal enerjiye yıkımıdır. anabolizma, küçük çevresel moleküllerden kimyasal enerjiyi kullanarak karmaşık hücresel moleküllerin üretimidir. Katabolik tepkimeler enerji açığa çıkartır, bu yüzden egzergonik (enerji veren)tir; fakat anabolik epkimeler enerjiyi tüketirler ve bu yüzden endergonik (enerji alan)tir. Besin bileşenlerinin çok çeşitli olması ve anabolizmada enerjiye ihtiyaç duyan biyokimyasal tepkime sayısının fazla olması sebebiyle belirli bir anabolik tepkimeyi, katabolizmadaki belirli bir enerji kaynağıyla eşleştirmek oldukça yetersiz olacaktır. Onun yerine hücre, bir ara bileşik, bir çeşit evrensel enerji birimi kullanır. Bu ara madde yüksek enerjili fosfat olarak adlandırılır. Düşük enerjili (inorganik) fosfatın ΔG0''ı (Pi olarak adlandırılır) 9-20 kJ mol-1'dir, fakat yüksek enerjili fosfatın (Ⓟ ile gösterilir) ΔG0''ı ~30 kJ mol-1'dir. Şekil 2: Bir fosfat grubunun dört formu pKa2 hücre içindeki koşulları temsil eder. Figure 3: Hydrolysis of Ⓟ and PPi. Figure 4: Resonance stabilization of Pi. 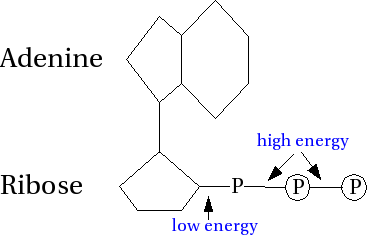 Resonance stabilization means that both OH and =O can "travel" around the phosphate. Of course, this is a crude analogy; they do not really move, the electrons are just "smeared" around the phosphate atom. This is also indicated by the use of the ↔ arrow, instead of ⇌; the three forms do not exist, they are just a way of writing down the chemical reality. As you can see in Fig. 3, the ΔG0' value for PPi⇌2Pi is ≪0, shifting the reaction strongly in favor of the 2Pi. ATP is regenerated from ADP (adenosine diphosphate), Pi and energy (from food); H2O is released in the process. ATP is the short-term energy "currency" of the cell. ATP concentration in the cell is low (ATP: 2-8mM; ADP:0,2-0,8mM). ATP is generated in high "turn over". ATP performs its chemical work through coupled reactions. Basically, any ATP-driven reaction is reversible, building ATP from ADP and Pi in the process. However, some ATP-driven reactions should never be reversed; these include nucleotide and protein synthesis. If these were reversed, the organism would disassemble its own DNA and proteins for energy, a rather unfortunate strategy. For reactions that should never be reversed, ATP can be broken down into AMP (adenosine monophosphate) and PPi, which in turn becomes 2×Pi. This reaction has a ΔG0' of -65,7 kJ mol-1, which is totally irreversible under in vivo conditions. It should be noted that AMP can not directly be converted to ATP again. Instead, the enzyme AMP kinase forms two ADP molecules from one ATP and one AMP. The resulting ADPs are then treated as described above. The destruction of covalent bonds takes up huge amounts of energy. The breakdown of an O2 molecule into two oxygen atoms needs ~460 kJ mol-1. Thus, nowhere in "living" biochemistry are covalent bonds actually destroyed; if one is broken, another one is created. Nonetheless, many biochemical functions are using so-called weak/secondary/non-covalent bonds. Since individual weak bonds are, well, weak, several of them have to occur in a specific pattern at the same time in roughly the same place. The short range of weak bonds. Hydrogen bonds equal an energy between 12-29 kJ mol-1. Hydrophobic forces are not actually bonds, so this list has four items, but still just three bond types. In a way hydrophobic forces are the negation of the hydrogen bonds of a polar solute, usually water, enclosing a nonpolar molecule. For a polar solute like water, it is energetically unfavorable to "waste" a possible hydrogen bond by exposing it towards a nonpolar molecule. Thus, water will arrange itself around any nonpolar molecule in such a way that no hydrogen bonds point towards that molecule. This results in a higher order, compared to "freely" moving water, which leads to a lower entropy level and is thus energetically unfavorable. If there is more than one nonpolar molecule in the solute, it is favorable for the nonpolar molecules to aggregate in one place, reducing their surrounding, ordered "shell" of water to a minimal surface. Also, in large molecules, such as proteins, the hydrophobic (nonpolar) parts of the molecule will tend to turn towards the inside, while the polar parts will tend to turn towards the surface of the molecule. Bu sayfa son olarak 4 Temmuz 2010 tarihinde ve 19.37 saatinde düzenlenmiştir.